Original Sources, from Britannica® Digital Learning, the extensive online resource that for many years has been a staple of college and university research projects, is now available to K-12 schools. The site has also undergone significant enhancements and sports a fresh and engaging new look, with a new user interface, improved search capabilities and a cleaner overall design. Original Sources is a gateway to our collective past and the important milestones that have shaped our civilization. 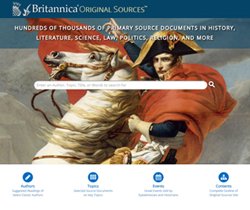 Original Sources, from Britannica® Digital Learning, the extensive online resource that for many years has been a staple of college and university research projects, is now available to K-12 schools. The site has also undergone significant enhancements and sports a fresh and engaging new look, with a new user interface, improved search capabilities and a cleaner overall design. Original Sources provides access to an extensive, continuously growing collection of more than 420,000 works of classic, primary reference sources for reading and research in twelve subject areas: world history, U.S. history, political science, law, literature, science, mathematics, social science, philosophy, religion, language and language arts. Among the historical figures whose words and works are included are Abraham Lincoln, Emily Dickinson, Martin Luther King, Jr., Plato, Jane Austen, Sun Tzu, Virginia Woolf and Winston Churchill. Previously available only to colleges and universities, the product is now available to K-12 schools, at a time when the need for independent research, information literacy and command of non-fiction sources is increasing at all grade levels. Like all Britannica websites, the new Original Resources embodies “responsive design,” which means the site recognizes the device that’s accessing it and “responds” by displaying optimally, whether on a PC, laptop, tablet or smart phone. As a result, student and teacher researchers can use it anywhere. Free trials are available to schools, districts and consortiums. Interested educators can call 1-800-621-3900 or go to http://britannicalearn.com/ for more information. Britannica Digital Learning (BDL) provides reliable, high-quality solutions to strengthen student achievement and educators’ ability to teach to best practice. BDL experts produce curriculum-aligned resources for all ages from elementary school to college that make creative and purposeful use of technologies widely used in schools today. Products include Britannica School, Britannica Academic, Pathways: Science™, ImageQuest™, and e-books. BDL is a division of Encyclopaedia Britannica, Inc., with headquarters in Chicago.